The northeast holds a rather distinct place for most Thais. Its something akin to the nation's heartland. Generally poorer than the rest of the country, this is where much of the nation's rice and other staple crops are grown. 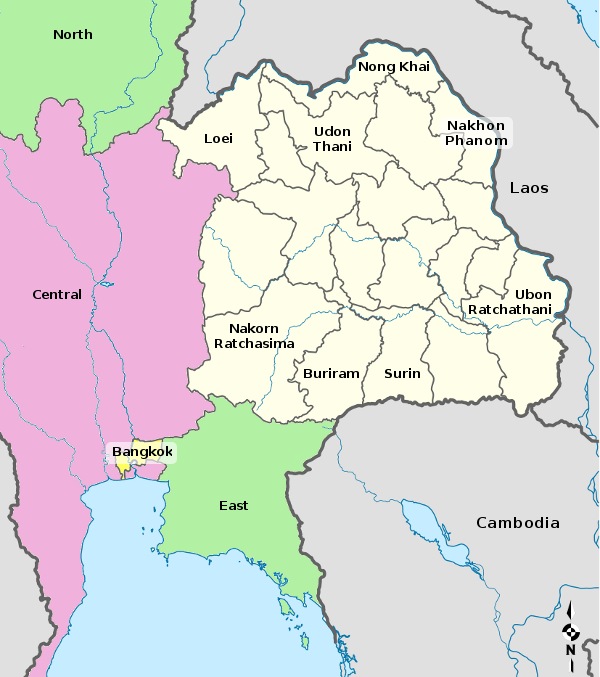 The region has a specific name, which is isan (the "I" is pronounced with a long "EE" sound.) Isaan also has a specific regional cuisine which is quite distinct from the central Thai food you will find in most western Thai restaurants. Isan also has a rich history, with evidence of occupation going back at least 5,000 years. The region is near the heart of the old khmer kingdom, and the ruins of khmer Hindu and Buddhist temples are found throughout the area. In recent years, some rich fossil finds have also sparked keen interest, with a few "Jurassic Parks" to be found here and there. Isan is probably the least touristed area of Thailand. Its an excellent place to spend time trying to see the "real" Thailand. This historical park contains some of the most extensive Khmer era ruins in Thailand. A new visitor center will be opened in 2002 to facilitate more visitors. National park which contains and surrounds the highest mountain in the northeast. Its a popular hiking and camping spot among Thais. Most Thais will refer to Nakorn Ratchasima as Korat. There's not much to the town itself, but several things to see in the area. In the 19th century the wife of a city official named Thao Suranaree led a band of local women who managed to defend the city against a Lao invasion by getting the Laotian soldiers drunk. A statue and shrine containing her ashes defends the western gate of the city to this day, and every year from 23 March to 3 April they hold a fair in her honor in the precincts around the gate. Famous silk weaving village about 20 miles south of Korat. Note, however, that prices won't be any cheaper than Bangkok. A large, extensively restored Khmer shrine dating from the tenth century. About 40 miles northeast of Korat. A small village about 10 miles southeast of Korat, famed for its ceramics. About the only thing worth seeing in this town. The annual roundup is held every November. About 35 miles east of Udorn Thani town, this archaeological dig has become a tourist attraction. Artifacts dating back 5,000 years have been found here. You will find cave paintings a several areas of bizarre geological formations near this village about 30 miles northwest of Udorn Thani.